Solar Cooling Solution provides a natural “fit” between solar energy and the need for cooling since they both peak during the summer. AET combine Solar Thermal Panels with an Absorption Chiller to convert free solar energy into cooling power. This will reduce your energy bills and carbon dioxide emissions. Various capacities of absorption chillers are available to fit your application. Currently, we provide high quality Solar FAÇADE and evacuated tube collectors with high efficiency, combining with absorption chiller unit, solar cooling can be achieved by converting the solar heat energy into cooling power. Ice storage systems offer building owners the potential for maximizing savings by using solar energy gain from weekends to produce ice for use in cooling during peak hours. The major advantage of utilizing solar thermal energy is in the summer when the heat load of the air conditioning system is at its peak, the amount of hot water produced by solar energy also increases, and therefore electrical consumption can be minimized by using Solar Cooling solution. 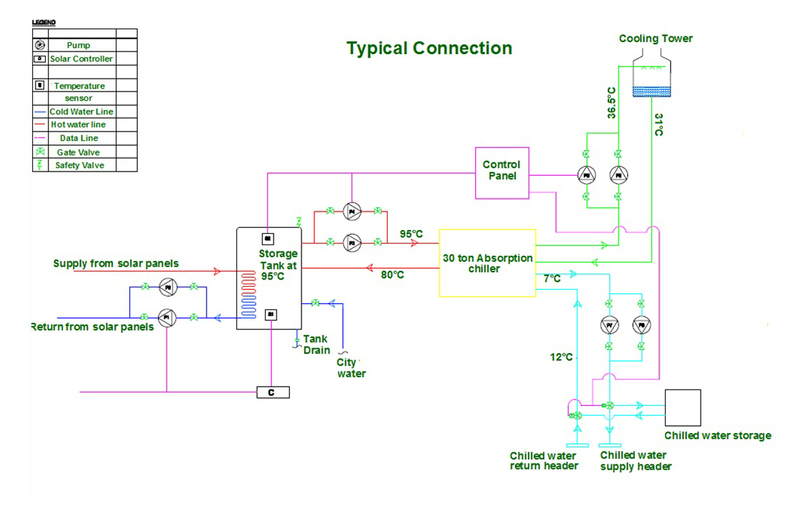 Absorption chiller can also utilize other waste heat sources such as that from a boiler of a factory. 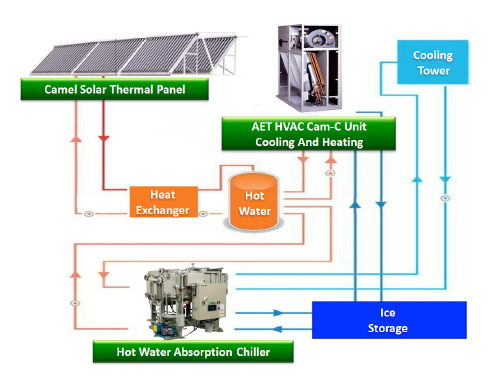 With years of proven air conditioning project experience, AET will offer one stop solar cooling solution to the clients. Our system consists of thermal solar panels, storage tank unit, absorption chiller, ice storage, auxiliary boiler and control unit. The limitation on the availability of fossil fuels, the growing demand for energy and the environmental impact by CO2 emissions, pollutants call for rational energy utilization strategies that would produce a sustainable environment. The energy sources that are currently been used can be classified into two groups: renewable and non- renewable. Renewable energy sources are derived from natural sources that are replenished constantly. Energy derived from sources such as the Sun, Wind, tidal waves, hydropower, biomass and geothermal energy fall into this category. These are clean forms of energy that do not produce any emissions, nor do they have any detrimental effects on the environment. Non renewable energy sources such as coal, natural gas and petroleum cannot be replenished. They will be consumed and will become non-existent. Therefore it is critical that nations need to diversify their energy sources and move towards sustainable energy sources to ensure the nation’s economy does not stall at any point of time in the future. 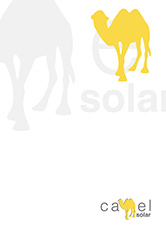 Solar Thermal applications extract the heat from the Sun for heating. Mostly, the heat energy is transferred to a heat transfer fluid such as water and stored for usage. The heat can be utilized as hot water for domestic & commercial use, drying, pool heating and even solar air conditioning. With the cooling requirement being the highest on the hottest day, solar air conditioning offers a practical solution as the performance of the system peaks when the demand is highest. Solar energy is a naturally available and clean energy source that can be exploited to meet the ever growing energy demand of a nation. With no emissions, low maintenance and high reliability together with lifespans of over 20 years, solar thermal energy forms a core part of sustainable energy systems. 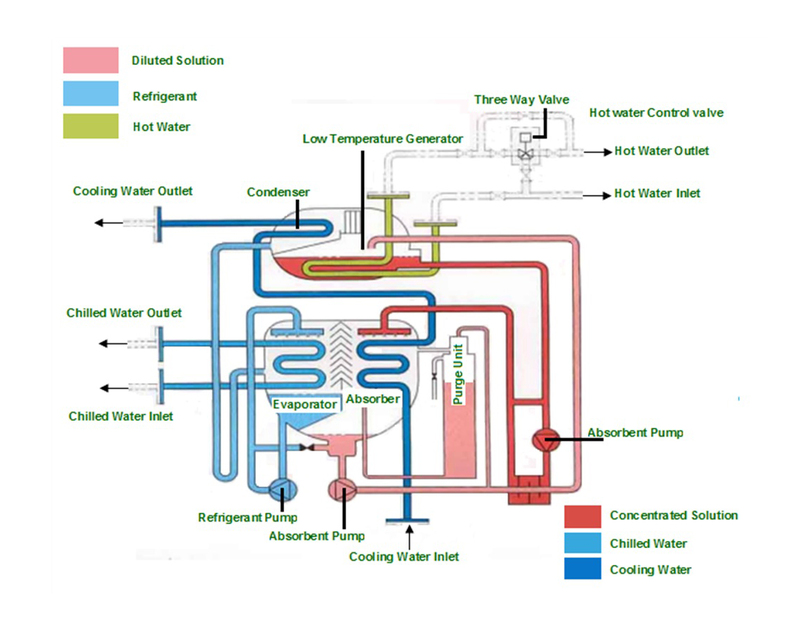 A conventional electric chiller runs on the vapor compression cycle. The pressure at the evaporator is very low causing the incoming refrigerant to boil and vaporize absorbing the heat from the chilled water entering the evaporator. The vapor enters the electric compressor where it is pressurized and sent to the condenser. Once the vapor has been pressurized, the vapor can condense at a temperature of around 30°C – 35°C, allowing the circulating cooling water to remove the heat from the condenser. The condensed refrigerant now goes through an expansion valve where its pressure is reduced again such that it can boil off at the evaporator to repeat the cycle. 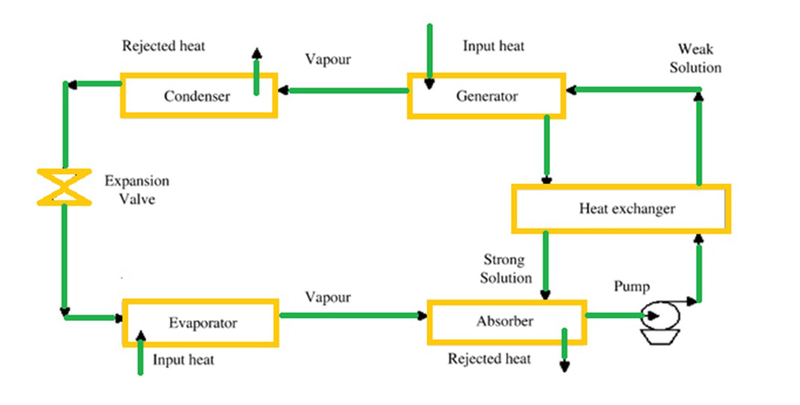 The absorption cycle works on the same refrigerating principle as the conventional electric chiller, except that the electric compressor and the expansion valve is replaced by the absorber and generator. The heat transfer medium used in the cycle is a mixture of water – and lithium bromide solution. The evaporator at  is in a very low pressure (vacuum) condition around 0.87 kPa. Water coming into the evaporator at , boils off at 5°C removing heat from the chilled water that flows across the evaporator coils. The water vapor from the evaporator moves to the absorber at  where concentrated Lithium bromide solution (which has a strong affinity to water) absorbs the water vapor. This creates the low pressure vacuum in the evaporator. The now diluted lithium bromide solution is sent to the generator at  where the hot water from the solar thermal panels is used to drive off the water vapor from the diluted lithium bromide solution. The water vapor enters the condenser at  where it condenses to liquid water releasing the heat to the circulating cooling water. The lithium bromide solution, now separated from the water vapor is a concentrated solution and is sent back to the absorber to repeat the process. The heat exchanger at  acts as a heat recovery system transferring heat from the hot concentrated lithium bromide to the colder dilute solution. Water from the condenser enters the low pressure evaporator to repeat the process.